Wanna pack on lean muscle mass and reduce post-exercise inflammation? Then try this tasty, easy-to-make, no-cook dish (from our upcoming book, The Athlete's Cookbook), which is made with ZERO mayo, is simply loaded to the hilt with lean protein and Omega-3's. OK, got to get back to writing and cooking now, so hasta la vista and all of that. :) Hope you enjoy the recipe! Directions: Wrap unpeeled garlic cloves in aluminium foil and roast at 400°F in a toaster oven for 10 minutes. While garlic is roasting, prep the other tapenade ingredients and then place them into the food processor. Unwrap and peel garlic, let cool for a few minutes, then add to the food processor. Pulse until smooth and set aside. Place drained tuna into a large, non-porous bowl. Then transfer the tapenade to the bowl using a spatula, followed by the 2/3 c. chopped Greek olives and 1 Tbsp. finely minced, fresh Italian flat-leaf parsley, and thoroughly combine. Divide into equal portions and serve with red bell pepper strips on the side. The red pepper strips can conveniently double as “utensils” to spoon the tuna-tapenade salad right into your mouth. 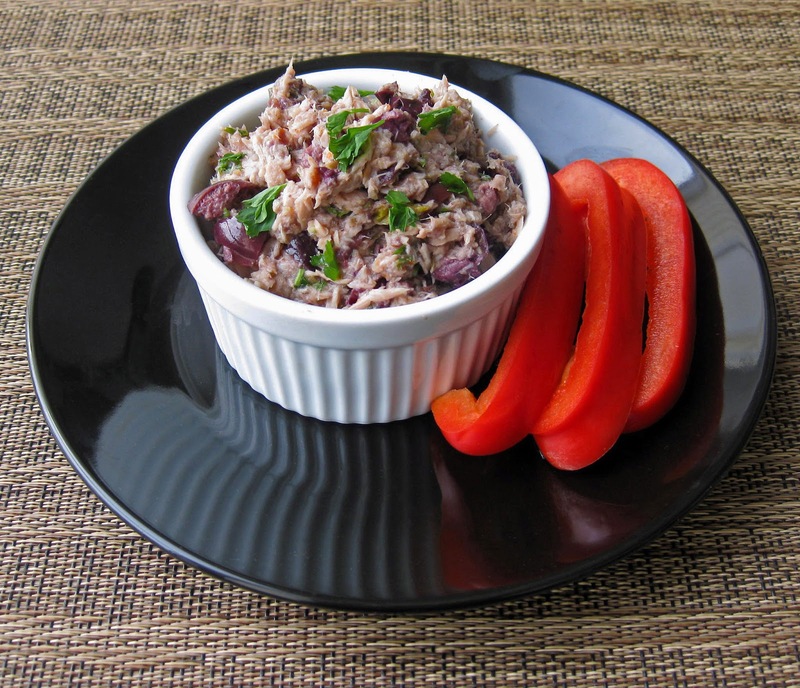 :) If desired, place tuna-tapenade mixture and red bell peppers on top of a salad or use as a sandwich filling.